Vertical gardening is the latest, most talked about trend in horticulture. 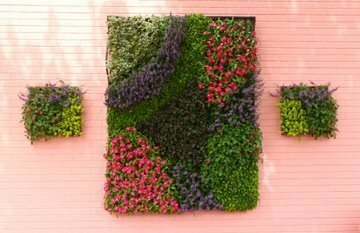 Cities are displaying outdoor vertical walls planted with anything from succulents to vegetables, and gardeners are eager to create the same look on their outdoor walls at home. If you’ve been to Raleigh’s Cameron Village recently, you’ve seen this hip garden movement in action. The walls are alive with art. In Durham, the entire wall at West Elm’s checkout counter has a vertical garden display spanning at least 30 feet. My first experience with living wall art was near the bathrooms at Longwood Gardens. It was love at first sight. 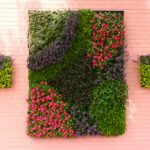 To meet home demand, companies like Wooly Pocket and Grovert offer products that make it easy to plant and hang living wall art. Recycled materials such as pallets can also be used. With a quick internet search you can find step-by-step instruction for making living art with this otherwise discarded lump of lumber. There are some tricks to growing vertically. First, it’s best to grow out your plants for at least a month before you hang your art. This not only helps their roots get established (and are not as likely to fall out once hung), but also allows the plantings time to grow upward. As the plants are growing in the holding area, occasionally pinch back the plants so they will fill out. If the living wall is hung immediately, the plants will want to promptly turn towards the sun and you will loose the opportunity to create a desired fullness. The fuller the plant, and the lower the profile, the less obvious it is that the plant wants to grow up instead of out. As with most container gardens, you will want to water nearly everyday. The sun exposure and heat will determine the frequency. In the shade, you may only need to water every other day. In full sun, you may need to water twice a day. These types of containers are also heavy feeders, so you will want to fertilizer every two to three weeks. If you get a chance, take a spin around Cameron Village and see this cool collection of vertical gardening, then feel free to try your own at home. Helen Yoest, author of “Gardening with Confidence®–50 Ways to add style for personal creativity,” is an award winning garden writer, garden coach and a sustainable gardener caring for her ½-acre wildlife habitat, Helen’s Haven, in Raleigh.